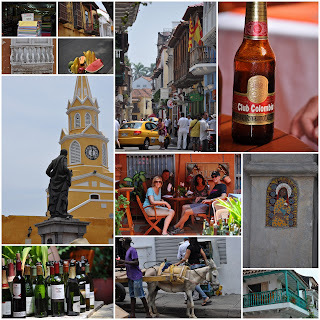 What’s the first thing that comes to mind when you think of Cartegena, Colombia? For me it was the 1980’s movie, Romancing the Stone with Michael Douglas and Kathleen Turner (great movie, by the way). But that all changed yesterday. 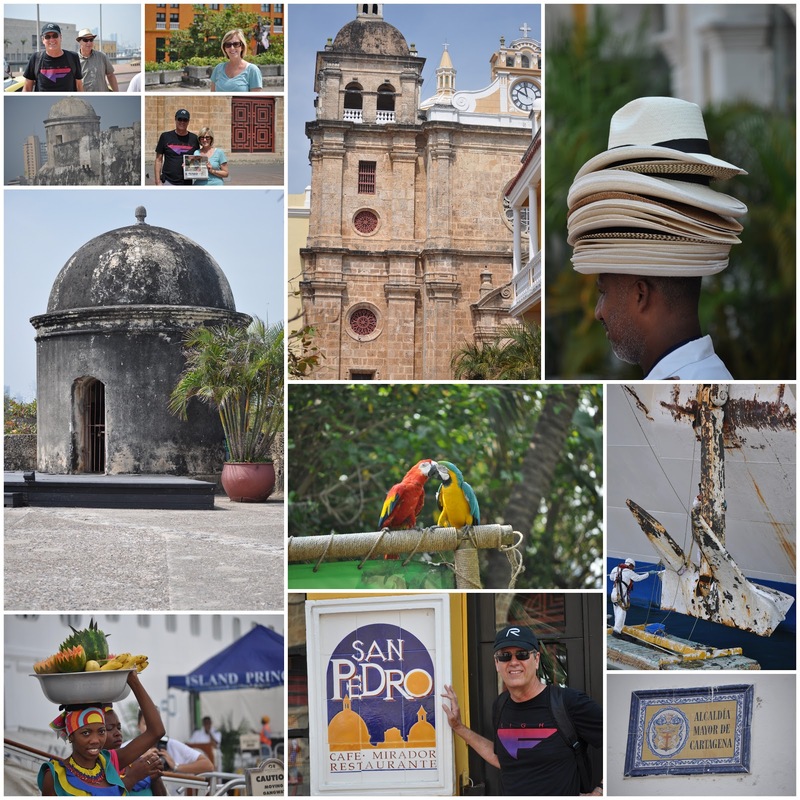 Now, to me, Cartegena is a UNESCO World Heritage site full of colorful people, buildings and food. 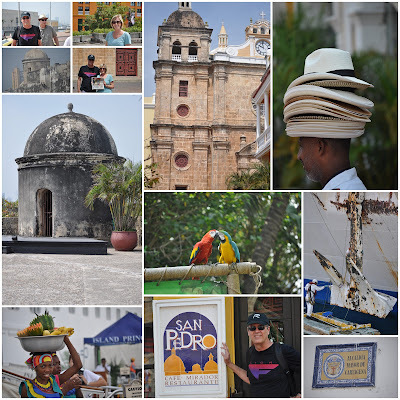 Cartegena is a walled city full of so much history, think Sir Francis Drake and many wars and battles to save their independence. We could have stayed here for a few days but our cruise ship was only in port for 6 hours. 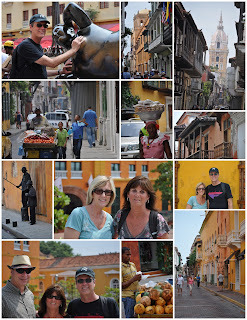 We did have time to walk around and see the beautiful, narrow streets full of brightly colored buildings, beautiful doors and windows and all sorts of people selling things in the streets. 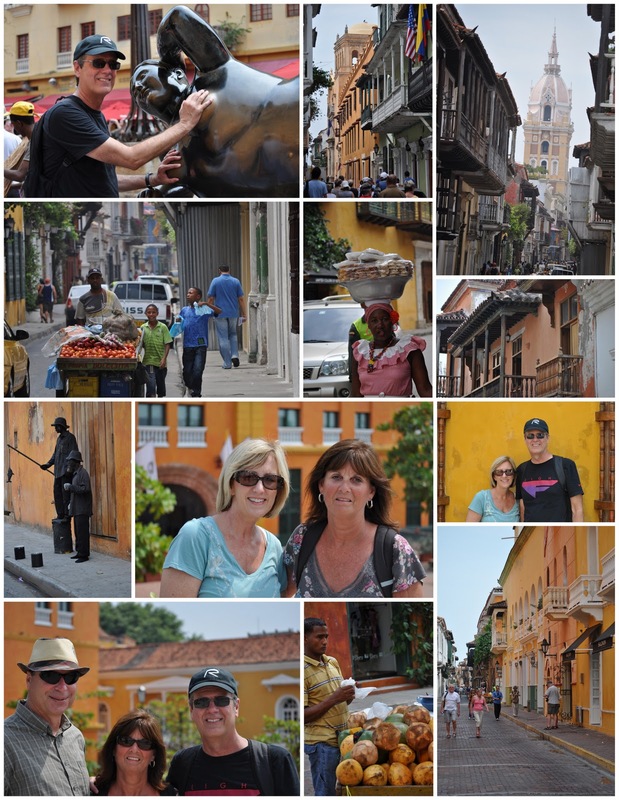 We were told by the cab driver that there is one policeman for every tourist in Cartegena, so safety was never an issue. Once again, Greg’s almost fluent Spanish was very helpful. It was very hot and humid, so a stop for a cold, Columbian beer was a welcome break halfway through our walking tour. There is a place in Milan, Italy, that has a mosaic of a bull on the floor. If you stand and spin on the bull’s testicles it will bring you good luck and it means you will return to Milan someday. We have done that in Milan. It is always fun to hear about the superstitious thoughts of an area. In Cartegena, it is rubbing the breasts of the statue (see photo) that is supposed to bring you luck, so Paul had to follow tradition. One of the streets we walked down had one fabric store after another. The price works out to about $2 a yard! They were mostly clothing fabrics because we were told a lot of people have their clothes hand made in Cartegena. Too bad, I was looking for quilting fabrics or a good price on Manos del Uruguay yarn. No luck, there. Our time in Cartegena went too fast. We didn’t have time to try any of the local food. It all looked really good. I guess that means we will return one day, soon. 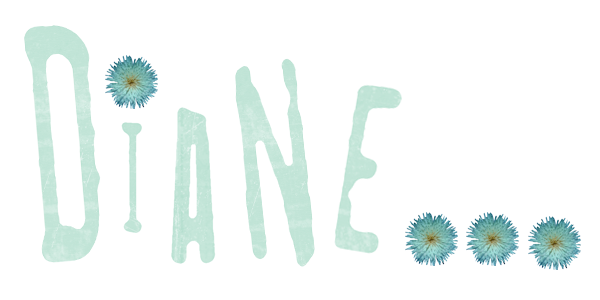 Sounds awesome. I've only heard great things about Columbia recently from all the people living in Floripa. I have also spun on the balls of the bull in Milan and am sure I will be back someday. I'm glad everything went well.